Working with the support of an established brand is such a major part of franchising that the industry has its own well-worn and much-loved phrase to describe it: 'Working for yourself but not by yourself'. This, and certain other terms, will come up a lot during your franchise research. Find out more on page 34! If you're looking for legal or financial advice, career guidance, business investments or seeking inspiration for growing your own business, there is something at the National Franchise Exhibition for you. Find out more within! 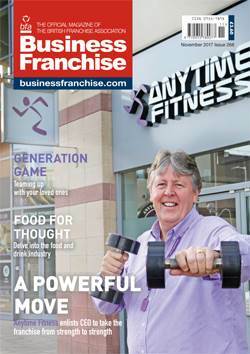 In this issue we have stories and journeys from franchisees that changed their lives. Find out how to join them on page 33, where you will find many different features, presentations, workshops and available franchise opportunities at the British & International Franchise Exhibition. As Pip Wilkins, chief executive of the bfa, points out in her regular column, 2019 will be the Chinese year of the pig. Will 2019 be the year you fulfil your potential and become your own boss? Read on - because in this issue we can help! 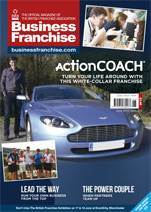 This issue we interview Marc Eccles of ActionCOACH as well as review the recent National Franchise Exhibitions. 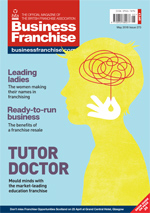 Finally we have top advice on taking on a master licence as well as how plan your finances for your franchise business. Welcome to the first issue of our new look! This month's cover story is Delightful Desserts, a franchise shaking up the dessert sector with selfie-worthy Instagrammable treats. After all, who dines out these days without creating a memorable social media moment? 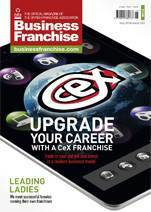 This issue aims to make things nice and simple for those of you in the franchise industry. There's a guide to the basics of franchising that breaks down the business franchise format as well as two very special features on flexible working and getting to run your business hands-on. In order to gauge the day-to-day realities of running a franchise, we'll often ask franchisees to describe their typical day. Almost without exception, they'll reply: "But, there's no such thing as a typical day!" or "No two days are the same!" 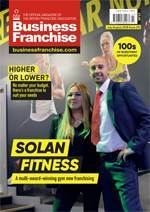 This month's issue features Solan Fitness and its founders' journey from rags to riches, as well as how both low and high investment franchises can offer you the prime opportunity to be your own boss. 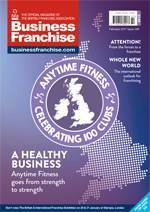 This issue features the official Show Guide to The Northern Franchise Exhibition on 22 & 23 June 2018 at EventCity, Manchester, the review of Franchise Opportunities Scotland in April, as well as the benefits of running a management franchise and how to take on a master franchise licence. 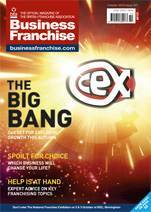 This issue features the official Show Guide to Franchise Opportunities Scotland at Grand Central Hotel, Glasgow on 25 April 2018, as well as taking the look at the women making their names in franchising and examining the benefits of a franchise resale. 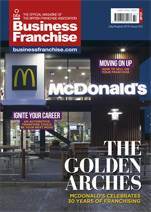 This issue features the official Show Guide to The British & International Franchise Exhibition on 9 & 10 March at Olympia London, the review of The National Franchise Exhibition in February, and the preview to the new Franchise Opportunities Scotland on 25 April at Grand Central Hotel, Glasgow. 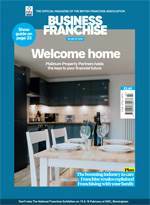 This issue features the official Show Guide to The National Franchise Exhibition on 16 & 17 February at Birmingham's NEC, and the preview to The British & International Franchise Exhibition on 9 & 10 March at Olympia London. Scan the horizon and see what opportunities lie in wait - our February edition includes an event preview of The National Franchise Exhibition, 16 & 17 February at NEC Birmingham, along with our retail franchise feature and a cover story from ActionCOACH's James Akin-Smith. 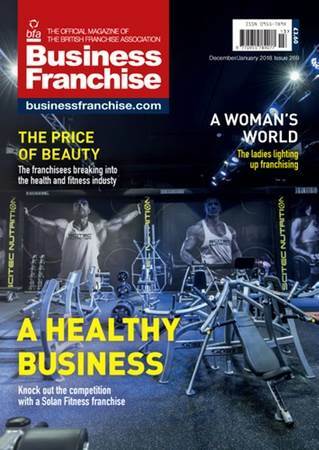 Discover more about the ladies lighting up franchising, the attraction of the heath beauty sector and Solan Fitness, a new fitness franchise knocking out the competition in our December/January issue. Now the dust has settled from event seasons, here at Business Franchise HQ we've finally had a chance to catch our breath and contemplate The National Franchise Exhibition. This month's 212-page numper issue is jamp-packed with everything you need to get your franchising journey started, featuring the show guide to The National Franchise Exhibition on 13 & 14 October 2017. 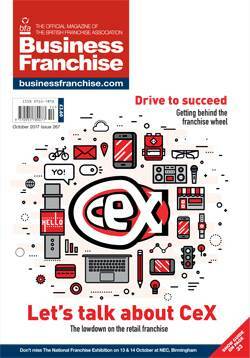 This issue features the preview to The National Franchise Exhibition on 13 and 14 October, and the review of The British Franchise Exhibition back in June. This month, we caught up with the franchisees that have decided to invest in the automotive sector and taken control of the wheel. 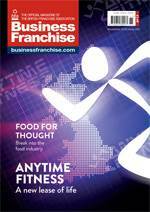 This year's show guide for The British Franchise Exhibition in Manchester is now available in this issue of the Business Franchise Magazine. Keeping your business in the bloodline can be a blessing in disguise; an already established relationship brings a huge amount of trust to a company to begin with. 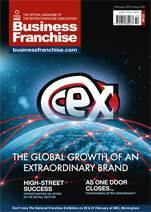 Welcome to the bumper October issue of Business Franchise magazine, which is brimming with features, day-by day account and inspiration from franchisees across the globe. I was tempted to fill this page with inspirational quotes from famous entrepreneurs. I wanted to pack the page with quips and notions from businessmen and women who have made a name in politics. Something to boost morale in a time of uncertainty, after history was made on June 23 2016, and Britain voted to leave the European Union. Fear can play a big part in holding you back when opportunity knocks. It’s also an emotion that I have learnt to embrace (as well as I can). Change is not always easy but, with time and commitment, the final outcome is worth it. Having to adjust your life can be a deciding factor when considering franchising, too. This isn’t just a guide to franchising; this is also your Show Guide to the British Franchise Exhibition in Manchester on 17 and 18 June. Head to page 33 to read our jam-packed guide to the event, where you’ll find a full exhibitor list. The year is well under way and we’ve been inundated with news and updates regarding the Brexit. But what is it exactly and why should we be worried? These are the questions on everyone’s lips as the upcoming June referendum continues to divide opinion. 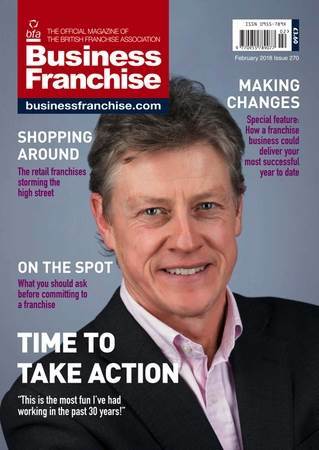 We’ve had a rollercoaster few weeks putting together this month’s bumper Show Guide magazine and we are proud to present you with 144 pages of all the information you need to get into franchising. The National Franchise Exhibition in Birmingham has been and gone and we are now getting ready for The British & International Franchise Exhibition in London. For this month’s magazine, we spoke to franchisees that joined the care sector and are combining businesses with their passion for helping others. Franchisee Paul Tame of Home Instead Senior Care spoke of how he moved from the corporate world into being "emotionally invested" in his new care career that he runs with his wife. 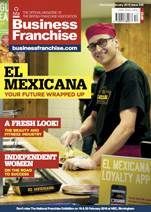 This month we interviewed five female franchisees about their road to self-employment. The gender pay gap is still an issue, so it’s not surprising that more women are deciding to take control of their careers. Indeed there appears to be new research released every week that highlights the discrepancies. After a whirlwind month joining the brilliant team at Business Franchise magazine, and a fantastic weekend at the NEC for the National Franchise Exhibition, it was definitely time to relax and research the themes this issue’s features - and boy are they inspirational! 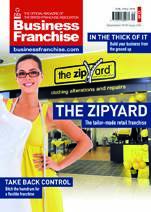 This issue is full of the the usual expert advice, interviews and opportunities to get you started in franchising. 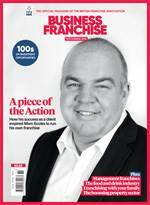 This issue is the show guide for The National Franchise Exhibition (2 and 3 October, NEC Birmingham) - the biggest British Franchise Association-accredited event of its kind this year. You can meet franchisors face to face, speak with financial and legal professionals, and hear from those who have already changed their lives through franchising. Like contemporary relationships, jobs are no longer ‘for life’, but we still know where to be loyal in work and love… for a while. The trend towards serial monogamy reminds me of one of the most important selling points of franchising - the fact that it won’t last forever. Romance isn’t dead, however - franchise agreements typically have terms of five or ten years. A new study has found that whilst most of us in the UK prize flexibility in our working lives, only 6% of job ads cite flexible working as a benefit of the vacancy being promoted. Furthermore, the higher up the pay grad, the less room there seems to be for flexible working hours. This might sound fair enough for well-paid captains of industry but it’s probably not representative of the needs of many with families or other everyday concerns. Inside these pages you’ll find profiles on many ethical franchise business opportunities, as well as legal, career and financial advice. 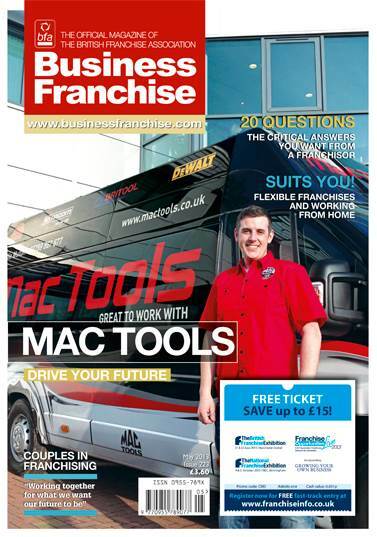 A series of in-depth articles, from page 18 onwards, turn the spotlight on management franchise, van-based operations and what it’s like to work alongside your other half. The opportunity to determine what sort of franchise will make the perfect affiliation for you and examine their offering is right here within these pages. For more in-depth research, a visits to the Franchise Exhibitions is highly recommended, where you can meet and hold discussions with, franchisors from every sector and industry type out there. More of our expert franchise opinions and advice can be found within these pages courtesy of franchise professionals, franchisors themselves and current franchisees all sharing their wisdom and experience. 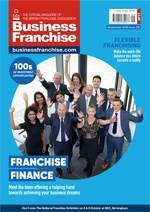 This issue of Business Franchise has plenty of pragmatic advice, real-life stories and no-nonsense information. In fact, facing up to reality is a recurring theme of this month’s Special Feature, ’Taking back control’, which looks at the attractions of franchising for those facing redundancy and finds several case studies of franchisees back on track. 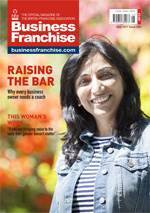 Business Franchise magazine contributed to the wider conversation about women in business with a profile of Dina Dwyer-Owens, co-chair of a multi-million dollar company and champion of women in trade services, on pages 18-20. 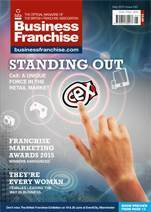 To read real-life case studies of sisters doing it for themselves, turn to the Special Feature on women in franchising on page 34. Running you own business as a franchise comes with the security of knowing there’s a support safety net and a tried, tested and proven system you are following. There’s evidence in the Special Feature that you can further enhance that feeling of security by working with family members, given that you will know each other well and share a common goal. One of the main attractions of a franchise for interested potential franchisees is the work-life balance running your own business can bring. It’s more than a job, it’s also a lifestyle and one that more and more people are taking into their own hands to achieve. If you think you might be one, don’t delay and start looking at it seriously, today! 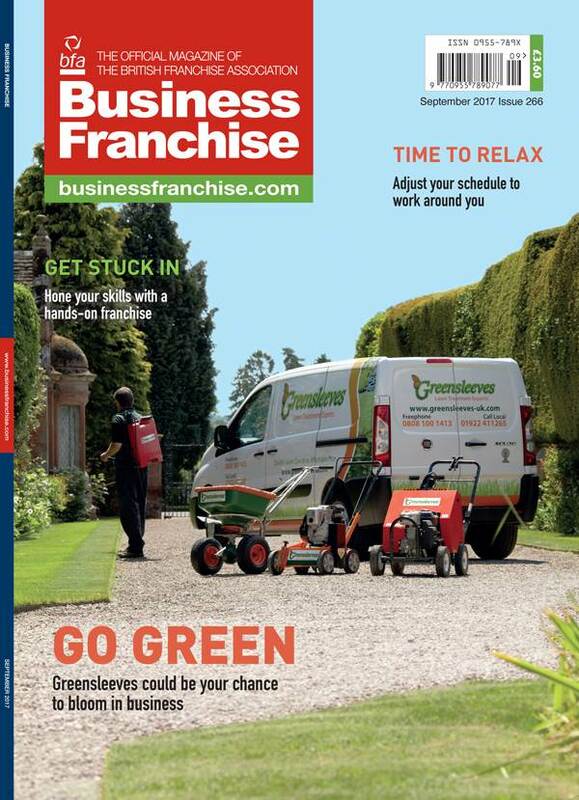 This month’s Business Franchise magazine looks at the flexible side of franchising, with case studies from franchisees who are finding a perfect work-life balance after years in the rat race and others who are pleasing themselves, with a one-person, hands-on operation. As well as profiles of ethical, quality franchise brands and top-drawer advice, inside the mag there’s also a preview of the forthcoming Franchise Opportunities Live event taking place at its new home of Park Plaza Victoria, London, on 5 and 6 September. The special feature this month is Couples in Franchising with case studies aplenty of people who live together making a living together. Running a business might put some couples under strain but the fact that they are using a tried-and-tested method and have the franchisor’s support greatly minimises the risk and therefore the pressure franchisees are under. When it comes to conducting your research into a brand, there is a lot to be said for a little face-to-face time. From these initial encounters you can gauge more about the way a franchisor run their network, their business proposition should be further investigated. There is also advice on the information you should be garnering sure these all-important meetings. With franchising proving to be a popular choice amongst ex-armed forces, we profile the journey of some inspiring franchisees who have made the leap from military service to running their own business. In the realm of franchising you’ll find housewives-turned-recruitment consultants, former high-ranking officers running retail outlets and mechanics working as mangers. Although some ‘types’ are a good fit for certain franchises, there are no rules when it comes to leaping into another occupation. Last year saw a glimmer of economic recovery for the UK when the Office for National Statistics reported a five-year high in retail sales. This strong high-street spending is extremely encouraging for two reasons; one, it is a sure sign that shopping benefits everyone, and two this data means the retail sector is being driven forward. A major selling point of franchising is that you can, as a franchisee, ‘be your own boss’ - but still have the back-up of an established brand and ongoing support from your franchisor. As such (and depending on the type of franchise) you are able to determine your own hours and control the volume of workload. Take a generous dollop of successful business model, swirl in an established name and reputation, mature with years of expertise and add a family-style network and head office support to stabilise the mix. Add to the bowl all the virtues of working for yourself: flexibility, controlling your hours, independence and a decent income and you have the ultimate recipe for success. The franchise industry is expected to continue a higher rate of growth than the economy, proving that investors can remain confident in their franchise business choices. Indeed, the franchise model works so well that well-known brand Dunkin’ Donuts is expanding in the UK with its restaurant network, with plants to open 150 franchise outlets across the country. 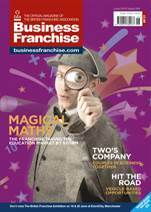 The content of your super September Business Franchise magazine is far from trivia and it’s highly likely that, during your research, you’ll find there’s many more brands out there that are franchises than you realise, and like me, you’ll be spotting them left, right and centre! The stats back it up. Did you know, for instance, that franchising makes an overall contribution to the UK economy of £13.4 billion? As evidenced in the regular case studies in Business Franchise magazine, franchising is no get-rich-quick scheme - consistent graft, at least in the first year or so, is a must to make the business a success. But rewards are there for those with the commitment. Franchising can always be seen as an 'honest day's work'. 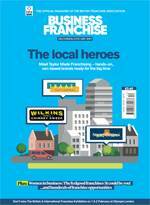 This issue is also the Show Guide to the British Franchise Exhibition taking place over 21 and 22 June in Manchester Central. This event is a great place to start your franchise research with a wide variety of franchise businesses representing a range of industries in attendance. Recent news stories have brought the whole issue of work-life balance back into the spotlight. Marisa Meyer, CEO of Yahoo, called for the company’s home-works to start spending full time hours at their nearest Yahoo office, with news causing criticism from the media.